Stretch is so lovey and sweet. She loves to be petted and is such a great companion. I love her little black pads. Hard to get any computer work done with her wanting to snuggle all the time. This little girl will need time to acclimate to her new home. She is so cute and will be a wonderful companion. She would probably acclimate more quickly in a quieter home. 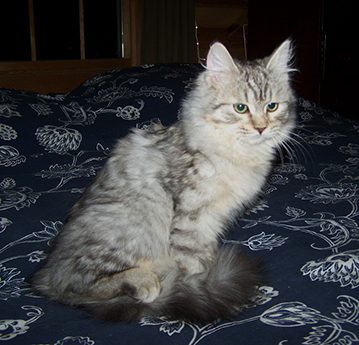 Tasha is Spayed, Vaccinated, and has a Micro-Chip with Life Time Registration. Fluffy kitten pictured below. Bunny is a "Love Bunny"... thus the name. She is so sweet and cuddly and loves to communicate verbally with you. My Brother-in-Law calls her Smarty Pants. Viktoriya is so sweet but has been separated from me most hours of the day due to my life situation. I am anxious for her to get full time attention again. She has been Spayed, Vaccinated and Micro-Chipped with a Lifetime Registration. Beautiful 4 yr. old Black Silver Mack. Fully vetted, Spayed, vaccinated and microchipped with a lifetime registration. Matriona is a sweetheart who is now ready to retire with her new family. She is Spayed, vetted and microchipped with a lifetime registration. Vadim will leap into your lap and the heart of your family!! The lucky family that gets Vadim, will enjoy his crazy affection and his playfulness. If you call Vadim, he come running and leaps into your lap. Sometime he does that without being called. Quite a surprise to those who come to visit and suddenly have a very fluffy cat smack dab in the middle of their lap! Vadim is 5yrs old, neutered, vetted and microchipped. Living with her new family, Faina is a very loving girl. She loves to cuddle. She does not enjoy the competition in our home. She would loves a lap devoted totally to her. Faina was born 5-18-05 in Russia. This is my girl. I have not been able to let her go. But now that I have to move, I feel I should so that she can get all the attention she needs to badly. When I have to leave the room she is in, she wraps her arms around my leg so I won't go. She needs to be somewhere where she can have all the attention she deserves. She does well with other kitties and they all do well with dogs. She could be shown and would do very well. The following is an email from the family who adopted Hugger, now known as Bella. This email absolutely made my week. Hugger was a love but at the bottom of the pecking order and was not allowed to blossom here. I am so happy for her new family and for her! Bella (Hugger) is a PURE joy!! Today was the first day she felt like playing and she immediately welcomed my husband home from his long trip with her usual loving introduction. As of yesterday, Bella took so well to my 3 year old and now loves being near her constantly. She seems to pick one person a day to make them feel very special. Another neat thing, today a friend came over with her sons and one of them is allergic to cats and he had no problems during his visit. And of course, Bella jumped on their laps LOVING all the attention everyone was giving her. What a blessing. I'll keep you posted with new pictures. Did I tell you my dad is interested in one now? He misses having a cat around the house. Talk to you again! Kira is a 4 1/2 year old retired girl who is now happy in a home with her new family. She is so loving, sweet and funny. As hard as it is, sometimes the kittens you love the most, you have to let go for their well being. Kira claims everyone and everything that comes through the door.